Week 3 The Art of Effective Communication: It’s all in how you say it / write it. According to Portney et al, (2008), “The key to successful project management is effective communication – sharing the right messages with the right people in a timely manner. 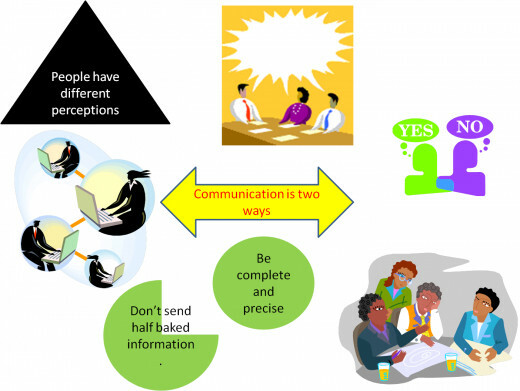 Through communication, people exchange and share information which influences attitudes, behaviors, and understandings. Communication may be informal, formal, written or verbal. Whatever form the communications take, project managers should plan and prepare so their messages are received and correctly interpreted by project audiences”. How did your interpretation of the message change from one modality to the next? The three modalities of communication we looked at this week are: email, voicemail, and Vis à Vis (face to face). In the email, it seemed snobby, arrogant, and a bit bossy. In my opinion, there is no way to accurately or effectively portray “tone” in an email. Other than changing the color and the font in an email, so as not to give the wrong impression or hurt feelings, one can only state the matter in a respectful way. In an email, there is an opportunity for a misinterpretation / translation issue. This perceived “tone” could also cause a misunderstanding or hurt someone’s feelings unintentionally. This should be a third choice, or a follow up to an in person contact, if a project team is in the same building(s). Voicemail is a little better than email. It can convey tone, context and meaning using voice. However, Voicemail is like email: one never knows when the message will be opened and listened to. Sometimes voicemails do not go to their intended target. Other times, there may be a malfunction in the telephone equipment. Then there are the times when the voicemail is just not picked up / heard. Vis à Vis (face to face) communication is a better way to get the information one needs if they are located in the same area(s). It is more personal, it can convey meaning and context, and it provides more motivation for the team member(s). Which form of communication best conveyed the true meaning and intent of the message? Vis à Vis (face to face) communication is the best form of communication to get the information one needs if they are located in the same area(s). It is more personal, it can convey meaning and context, and it provides more motivation for the team member(s). People, in general, respond better. There can be no mistaking a person’s facial expression, tone, inflection, mannerisms, etc. which cannot be conveyed in an email or a voicemail. The factors that influenced this decision: face to face communication is more effective because it is more personal. It also best conveys the message that she may miss her deadline. She is able to connect with the team member and they can also iron out any wrinkles in the transfer of information. Not everyone is comfortable with Vis à Vis contact. So voicemail should be a second option of communication. They may not check their mail on a regular basis and may “miss something”. If they do not check in regularly, it could cause Jane to miss her deadline. The last option would be that if one needed a confirmation, email would be a good avenue. However it still does not minimize the chances for a misunderstanding / misinterpretation..
A synthesis of thoughts regarding what this activity implies about communicating with members of a project team. As a PM, the persons who need to know and want to know about the project, should be the ones receiving the information. One needs to take into account the location of other team members. It may be that they are spread worldwide and this poses another issue – lack of face to face contact. However, with the technologies we have today, we have the ability to Skype meetings or in the education systems – use BlackBoard Elluminate / BlackBoard Collaborate. What did you learn that will help you communicate more effectively with others in the future? Wow, really nicely done. First of all, I couldn’t agree with you more, the vis a vis modality of communication seems to me to be the most reliable and efficient form. It is much harder to misunderstand or misinterpret a person when you are speaking to them face to face. Secondly, I really appreciate the graphics you added to your blog. They kind of reconfirm the visual necessity in communication. Much like professors who use visually pleasant slides during their lectures, the visuals your provided allowed me to make a connection between what I was seeing and what I was reading, thus cementing my understanding and helping me walk away with an understanding of what you were trying to share. I’m sorry this is coming off so late, but I seriously left a lengthy post for week 3, but for some reason its not here, so lets try this again. There is no other way to communicate, that allows people to truly get an understanding of what a person is saying and meaning. And I think in today’s day and age, with the ability to skype or facetime with people, there really is no excuse for people not to have a face to face discussion during projects like this, even if they are separated by great distance.